You don’t have to be a lighting nerd to fall in love with Helios Touch, a magnetic and modular LED lighting system that even kids will want to play with. Recently launched on Kickstarter, Helios Touch is made up of hexagonal wall lights that turn on and off by touch and snap together via magnets to cover a wall with any tessellated shape you desire. The customizable lighting system allows users to create site-specific and space-saving lighting solutions, whether it’s to illuminate a small cubicle or for lighting up an entire wall. Designed by James Vanderpant and James Glover of Dyena, Helios Touch uses moveable hexagon LED modules to create light art. The slim modules measure 4.3 inches (11 centimeter) across and are 0.4 inches (1 centimeter) thick. Each 6.3-watt unit produces 400 lumens, which generates around the same brightness as a 40-watt incandescent bulb. After a central Helios Touch panel is rigidly mounted onto the wall (with nails or sticky pads), users can easily expand upon their tessellated lighting design. The modules snap together via magnets, located on the sides, which also allow electricity pass through from one piece to another. 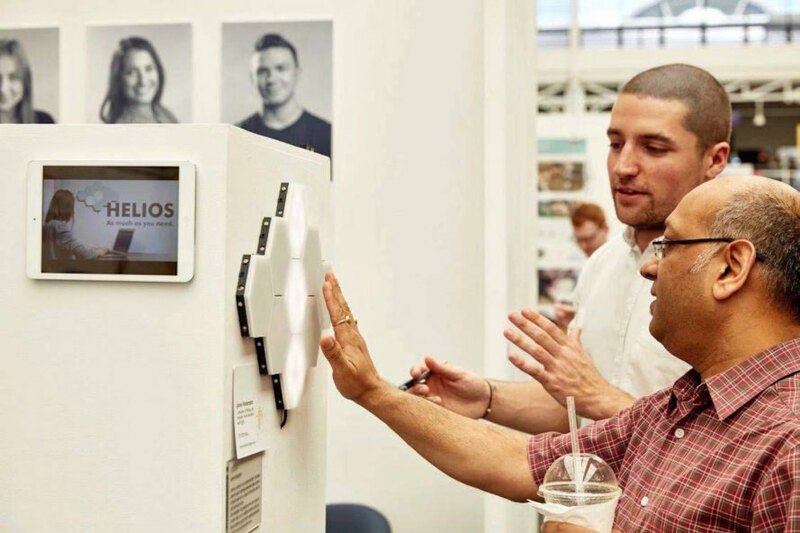 A capacitive sensor is installed behind the Helios Touch surface to allow users to turn individual modules on and off with a simple touch of a finger or swipe of the hand. Currently up to 105 tiles can be joined on the same power circuit. The modular LED panels are powered by a mains power supply; a 120 / 220 v to 24v 2A adapter can power up to 35 panels. The Helios Touch modular lighting system is currently on Kickstarter, where a pledge of £49 (US$61) includes a pack of five panels and a power unit. The slim modules measure 4.3 inches (11 centimeter) across and are 0.4 inches (1 centimeter) thick. Designed by James Vanderpant and James Glover of Dyena, Helios Touch uses moveable hexagon LED modules to create light art. Each 6.3-watt unit produces 400 lumens, which generates around the same brightness as a 40-watt incandescent bulb. After a central Helios Touch panel is rigidly mounted onto the wall (with nails or sticky pads), users can easily expand upon their tessellated lighting design. 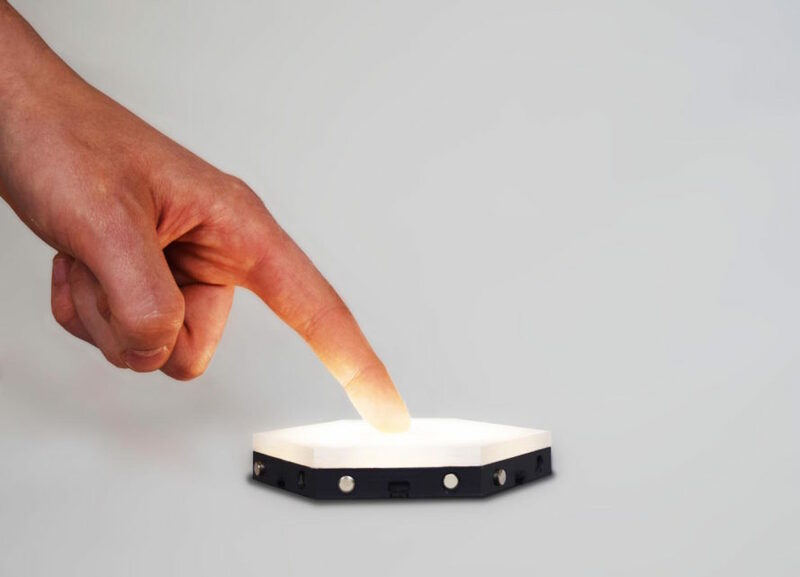 A capacitive sensor is installed behind the Helios Touch surface to allow users to turn individual modules on and off with a simple touch of a finger or swipe of the hand. The modules snap together via magnets, located on the sides, which also allow electricity pass through from one piece to another. Currently up to 105 tiles can be joined on the same power circuit. The modular LED panels are powered by a mains power supply; a 120 / 220 v to 24v 2A adapter can power up to 35 panels.